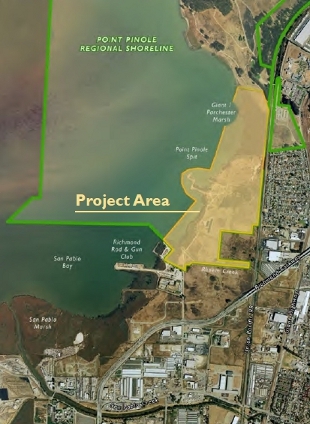 Questa led a study team in preparation of an Environmental Impact Report, regulatory permitting, design documents, and ongoing implementation assistance for the Breuner Marsh Restoration and Public Access Project, part of Point Pinole Regional Shoreline. This award-winning project, adjacent to adjacent to Giant Marsh, is a pioneering project that features resilient design to accommodate Sea Level Rise (SLR). 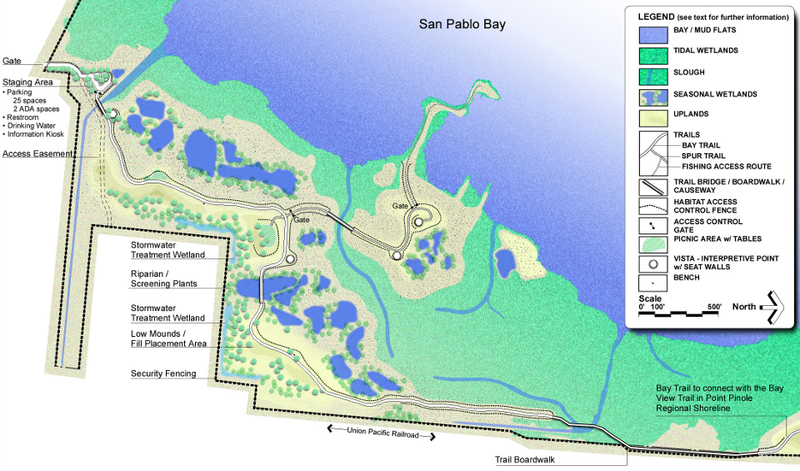 providing a unique opportunity to restore, enhance and protect wetlands and sensitive species habitat, complete a key, regionally important gap in the Bay Trail, and provide an opportunity for shoreline access, including fishing, passive recreation, hiking and nature viewing. Improvements include a vehicle staging area with educational exhibits, vault toilet, and stormwater facilities. The project incorporates environmental restoration aimed at protecting sensitive species and providing suitable habitat that is compatible with public access. In addition to almost one mile of new Bay Trail and shoreline access opportunities, the project includes an 1,100 foot long boardwalk to avoid impacts to adjacent habitat and to close a gap in the Bay Trail. This project is unique among larger salt marsh restoration projects in the greater San Francisco Bay Area since it focuses on the removal of fill soil to re-establish the natural marsh plain, while many restoration projects involve breaching dikes and levees to re-flood sunken bayside farmlands or salt ponds. Providing a self-mitigating project that will be acceptable to regulatory agencies and that accomplishes public access and restoration goals. Creating and enhancing sustainable tidal wetlands (30 acres), freshwater seasonal wetlands, transition zone habitats, California coastal prairie and other types of habitats. Developing restoration and public access designs that are compatible with wildlife use, and will be sustainable in the context of predicted future sea level rise. Protecting, enhancing, and creating habitat for sensitive wildlife species. Managing soil resources in a safe and cost-effective manner that considers soil contamination and cover requirements, salvage and reuse of topsoil, and screens for soil fertility defects. Developing cost-effective project alternatives, taking into consideration all potential costs; planning and design, permitting, hazardous material handling, construction, performance monitoring, and maintenance.